Um, looking for a pen that can be a dedicated red ink drinker. Mostly this is for marginalia and other corrections to academic papers, so it needs to be quite fine and not too scratchy. Does anyone have a recommendation for this kind of set up? I would prefer not to spend too much (the list above has a large price range, and is only for example). If the M2 is likely to be up to the task, based on other people's experiences with it, then I will likely go for that but I'm open to other suggestions. I keep Wing Sung 618 and 601 demonstrators permanently filled with something bright and contrasty for annotation and mark-up. Both are solid pens with interesting filling systems (piston and vacumatic plunger respectively) for under $20 each, shipped. The 601 nib seems a bit finer. Replacement fude-style nibs can be had, which enables fine reverse writing and a broader line on the normal side. I use a Platinum Preppy. If I remember correctly the converter was more expensive than the pen. I bought a pack of 5 transparent cartridge/converter Jinhaos a couple of years ago. One is for Baystate Blue, another for red ink. There was a choice of nibs and I chose fine. Sorry I can't remember the model number but there are always offers on eBay for ridiculously cheap Jinhaos which almost invariably (in my experience) work well. I've learned the hard way to keep red ink away from pens you might wish to use for another purpose. 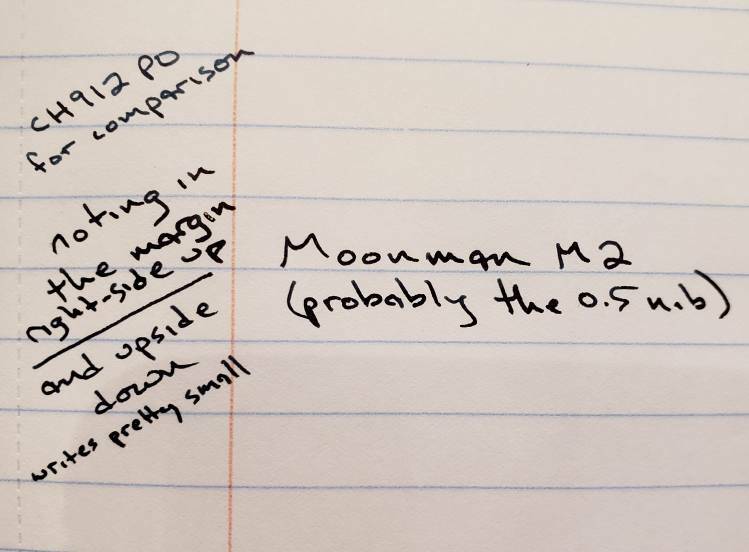 I had trouble with the Moonman M2. The one I got was reluctant to deliver ink to the paper. I went through the usual routines to deal with that failing without success. It was one of the very few pens I have consigned to the landfill. That's why I refill the carts. That's why I eyedropper Preppys. That said, the Con-70 converter in my Kakuno costs about the same as the pen. I do have a couple of Pilot Varsities with red ink, but they wouldn't meet your "quite fine" preference. 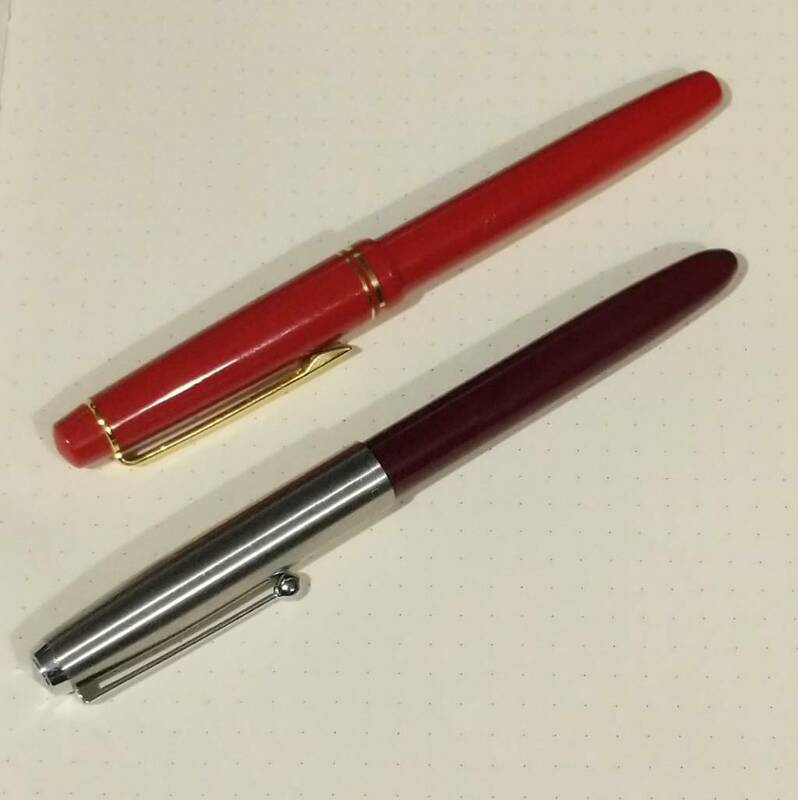 Honestly, for the tiny amount that I use red ink, there's no point in being a fountain pen purist, as I don't have any good pen that I want to dedicate to that. I have a Pilot G2 gel pen with red ink. It's a 0.7 mm tip, which is not particularly fine, but you can get 0.5 mm refills (which are finer than they sound in fountain pen terms), and I believe even 0.38. Every now and then I may want to write as much as one full sentence in red, or circle something, but I wouldn't be unhappy writing as much as a paragraph or two, if there were some reason to have it in that color. Of course, if your marginalia are extensive, you may prefer to stick with a fountain pen after all. If my writing habits were different, and I wanted to dedicate one of my fine nibbed fountain pens to that color, I'd probably go with the Pilot Capless with the extra fine nib. The harder question would be what red ink to use. Do you already have one in mind? I've tried Noodler's Fox in the past, but found it a bit cloggy. I use a dedicated Pelikan M205 EF Clear Demo inked with Montblanc 'Corn Poppy'. Having all of them, I would say your choices are all good. The 912 is my choice for that task, but considering cost, the Moonman will certainly do the trick. For your comparison. My M2 was listed as a fine nib, which is 0.5, not the 0.38 you're looking for. This should give you a feel, though. Thing is I have a bottle of Oster Fire Engine Red, Diamine Red Dragon, Sailor okuyama and Sailor Ink of Naotora. I don't want these to go to waste. On the subject of red inks, Deb mentioned not using it in pens that one may want to use for other inks, but I'm not sure why that is (other than the rumour of red ink melting rubber ink bags in vintage pens). If anyone can expand on this that would be kind. Okuyama is very burgundy. Pretty, though! I have a couple of $15 Delikes with needlepoint nibs, but they might be too small for you. And a 'JinhaoPrera' or two, ditto. Fifteen dollars for the Delike (can't recall the name, but a Sailor Sapporo copy), two for the Jinhao. I have J. H. Rouge Grenat loaded in a Jinhao 51A (hooded) and de Atramentis Oriental Red in a Wing Sung 3001. I've had good luck to receive each of these pens with quite nice 0.38mm nibs. EoC, you might also look at the Pilot Kakuno. Comes in a Japanese extra fine, and you can get them for $12 to $15 with free shipping from ebay. Buy 2 or 3 in different colors for different projects! Add a box of 12 red ink cartridges for $7. The nice thing about the cartridges is you can syringe fill them when empty and they hold 0.8 mls of the ink you currently have in your bottles. A possible downside to the Moonman is that it's an eyedropper. If there are drying issues with either the ink or nib, you can screw a converter down to force ink into the feed, but you can't with an eyedropper. Then again, tapping the nib on the paper often works. I use Diamine Coral in a Sailor Pro Color 500 (steel nib, F) that I got when they were going for about £25. Looks like the Lecoule is the model going for that price at present. Nice and neon bright (at that size it looks more like neon red than pinky), well-behaved flow rate - dryish so it suits all sorts of paper but not at all uncomfortable. That depends whether you like the Sailor feedback, of course. May be too small for you, from what you've said before about pens? My OH has red ink in an Eco. I also use a lot of orange ink. I've got a PenBBS 469 (the two-ended one with clear centre) with Diamine deep dark orange and pumpkin in it. Again, the nibs are dryish but smooth. Each compartment is eyedroppered. I've not had any issues when they get near empty, I guess because the volume is a lot lower than your typical eyedroppered pen. That's quite a large pen in the hand but not heavy. I had a fair number of different oranges in a Hero 616 but I don't really like the hooded nib on that one and there was a lot of nib creep - I don't use that pen anymore. That was also rather less fine. (Without having used it yet, I prefer the looks of the hooded nib on the Jinhao 51A because it is larger and you see more of the nib). Red inks have a tendency to be more staining and you will find that many of them will leaved the inside of your converter red. For this reason it is generally a good idea to have a pen for red ink. I use Nikita in a similarly red Jinhao 159. The efforts in flushing all the red ink out would wear my converter out.